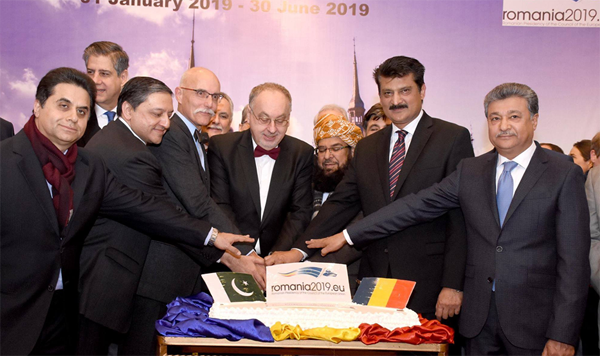 ISLAMABAD, Jan 25 (APP):Presidency of European Union is a huge responsibility for Romania for the next six months, Nicolae Goia the ambassador of Romania said this at the reception held on Thursday evening. The reception was attended by the official dignitaries, diplomatic community in Islamabad as well as the ambassadors of European Union. Addressing the audience Nicolae Goia said during their presidency Romania has to deal with three bigger challenges, the EU is facing today including the Brexit deal, approving the multi annual budget of EU for 2021 to 2027 and the elections. He said Brexit is a major challenge for Romania in the Presidency adding during its six-month mandate, Romania has the chance to prove its strong support for advancing with the European project of integration, acting as a genuine and honest broker in order to find solution that enables European agenda. He said the approach of the Romanian Presidency revolves around the principle of cohesion among Member States, regions and citizens. “The motto of our mandate is therefore “Cohesion, a common European value”. From this perspective, Romania aims at achieving tangible results and at maximising the benefits that a strong and cohesive Union could bring to each and every citizen. Enhancing the political cohesion and the economic dimension of cohesion will go together with enforcing the social component of cohesion for the betterment of the Union as a community but, even more important, for the benefits of the citizens. The Romanian Presidency’s will focus on four main pillars, which will be seen in the specific actions of ten configurations of the Council of the EU, as well as in the events that will that will take place throughout the semester and they are: 1/ Europe of convergence; 2/A safer Europe; 3/Europe, a stronger global actor; 4/ Europe of common values. During its six months mandate as the rotating Presidency of the EU Council, Romania will deploy considerable efforts both in terms of the substantive matters, which are of high complexity, and in terms of logistics, which implies extensive preparation process and continues to require the mobilization of the entire Romanian public administration and society. The following six months are also a great chance to bring Romanians closer to the citizens of the other Member States, to present a European country deeply anchored in the cultural and spiritual tradition of the European continent. Regarding the external relations of the EU, during its mandate the Presidency of the EU Council will support the efforts of the High Representative of the Union for Foreign Affairs and Security Policy as the chief co-ordinator of the Common Foreign and Security Policy within the European Union in the crucial files like identifying the means and ways to cope with the present challenges, enlargement process, security and defence, West Balkans, multilateralism, the Easter vicinity and to ensure an efficient and coherent action of the EU.